Hello! Wow, it is pouring buckets outside right now! Hope you are having nicer weather where you are : ) I made this for today's Color Challenge on SCS to use Taken with Teal, Close to Cocoa and Very Vanilla. I didn't have any Teal so I used Bermuda Bay as a substitute. I used this pretty Hibiscus image from Artful INKables. I stamped it with Close to Cocoa and colored with Copics. I added Champagne Kaiser Pearls and some Diamond Stickles which you can't see very well. This awesome sketch is from the Mojo Monday blog and was designed by Maria Gurnsey. I will leave the full recipe below : ) Thank you so much for stopping by today! This is just so striking and beautiful! Just the perfect color combination! Very nice card! Love your color combo! WOW WOW Girl you aced these colors...this is stunning work..love the texture, your borders, and that gorgeous flower...You even added those pearls...GORGEOUS! What an amazing card, Kerri! Love the pearls you added! How pretty this is! I like the different textures and the pearls on your flower. I found your blog through Rebecca's and I really like what I see. Off to look at more posts. 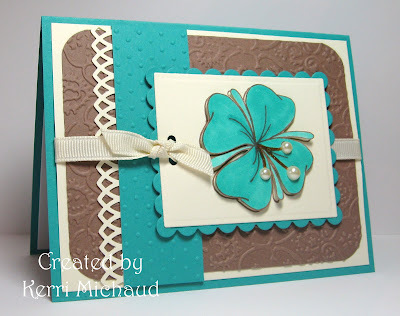 Oh this is sooo pretty...love these colors together...and I think the lil' pearls are a great touch. Hope the rain goes away for ya' soon! LOVE, LOVE, LOVE this color combo! I was just telling my girlfriend how I love the Bermuda Bay and Chocolate Chip (or Soft Suede) color combo, and this is very close! You did an awesome job on this Kerri...that hibiscus is so pretty with the pearls, and I love that border too! Very pretty! I like the pearls you added to the flower, nice touch! I love, love, LOVE this card! You did an amazing job!